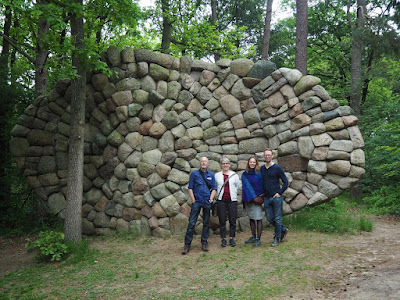 On Sunday I visited the Kroller-Muller Museum in the Hoge Veluwe National Park near Arnhem with (pictured from left) Ted, Angela, Sophie and Philipp. The Kroller-Muller Museum boasts the world's second biggest collection of Van Gogh paintings (after the Van Gogh Museum in Amsterdam); it also has a vast sculpture garden where, after some searching, we found a work called Echo van de Veluwe. If Northland readers recognise the sculpture's style that's because it's by Kerikeri artist Chris Booth. His New Zealand works include the Rainbow Warrior Memorial at Matauri Bay, Te Whiringa o Manoko on Kerikeri Domain, and (with Te Warahi Hetaraka) Waka and Wave in Whangarei. 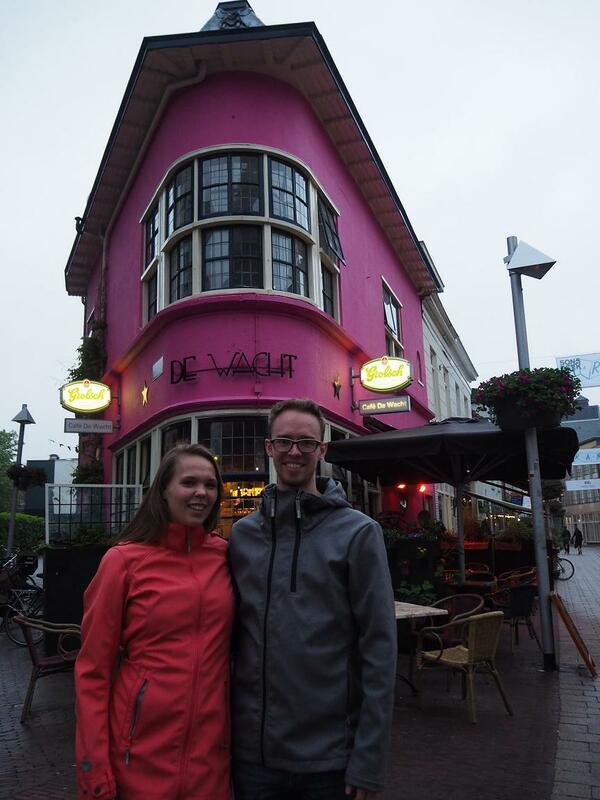 My cousin Sophie and her boyfriend Philipp live above a pink cafe in the centre of the city of Arnhem - those are their living room windows on the first floor. It's a very lively place to stay. Sophie and Philipp took me to the famed Kroller-Muller Museum (more about that in another post) and for a walk around Arnhem which, among other things, boasts a scuplture of a giant pink aardvark wearing a party hat. No, I don't know what it means either. Sophie and Philipp, thanks for a super-leuk weekend. Next month I'm going to my cousin Sophie's graduation concert at the conservatory in Arnhem. It turns out her boyfriend Philipp is also super-musical. On Saturday night a bunch of us went to see him play with his 12-piece band, called De Raad van Toezicht, at a jazz festival in the city of Amersfoort. That's Philipp playing the keyboards on the right. De Raad van Toezicht is something of a joke name; it translates roughly as "the Board of Governance". Maybe someone out there can come up with a better translation. 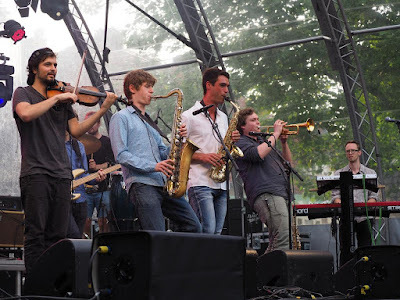 Next month Philipp's band is playing at the North Sea Jazz Festival in Rotterdam, the top jazz festival in Europe. I fully expect both Sophie and Philipp to become immensely successful. I'm also trying to persuade them to tour New Zealand. Raad van Toezicht groupies (from left) Ted, Matthijs, Floor and Sophie. I had a lovely day on Saturday visiting my cousin Jelke and her family - hubby Marcel and daughters Kathelijne and Mirthe - in Zeist, a small town near Utrecht. 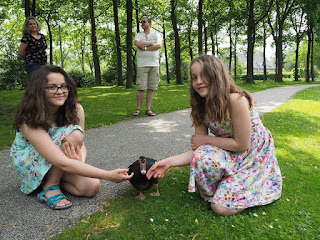 It was an animal-themed day - first I was introduced to the girls' pet rabbits; later, during a walk to a nearby castle, we met possibly the world's tamest duck. Kathelijne and Mirthe were little children when I last saw them so it was awesome to catch up again and see how they've grown. 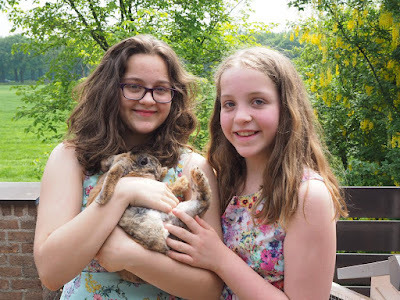 Girls, it was great to meet you. 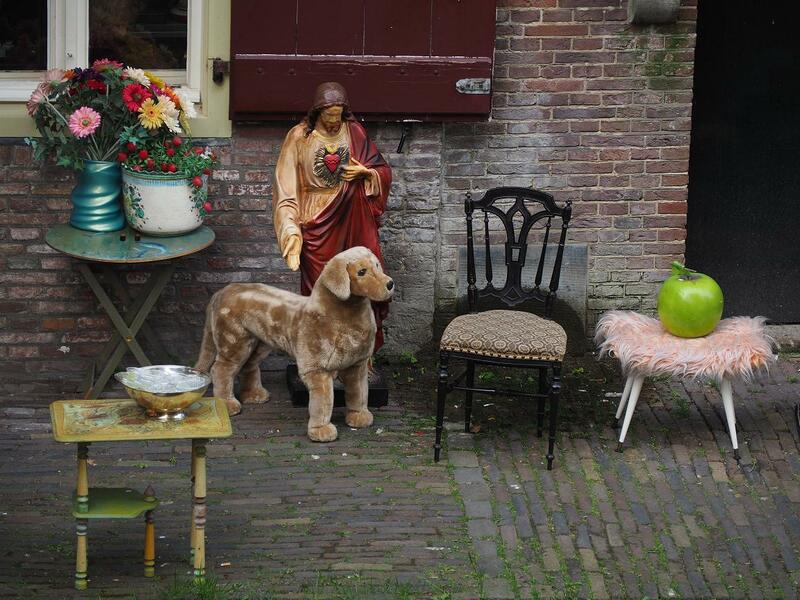 ... and here's a still life with Jesus, a dog and a giant apple. 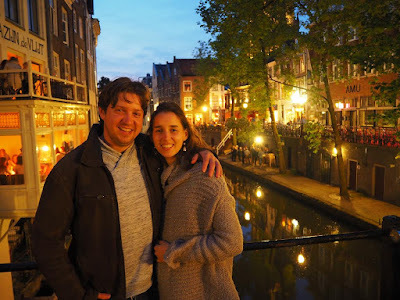 Four years ago, when my cousin Anna and her boyfriend Sjoerd visited me in Kerikeri, they promised to take me to their favourite pub in their home town of Utrecht, about half an hour by train south of Amsterdam. 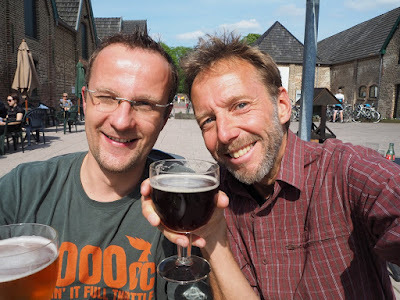 I'd forgotten all about it but they hadn't - so last Friday they took me to Cafe Belgie, where you can choose from 200 different Belgian beers. Choosing takes longer than drinking. 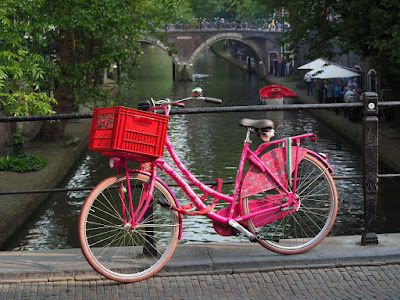 Utrecht is also a very lively city with distinctive canal-side cellars, many of which have been converted into bars and cafes. ... and here they are again, outside Cafe Belgie. 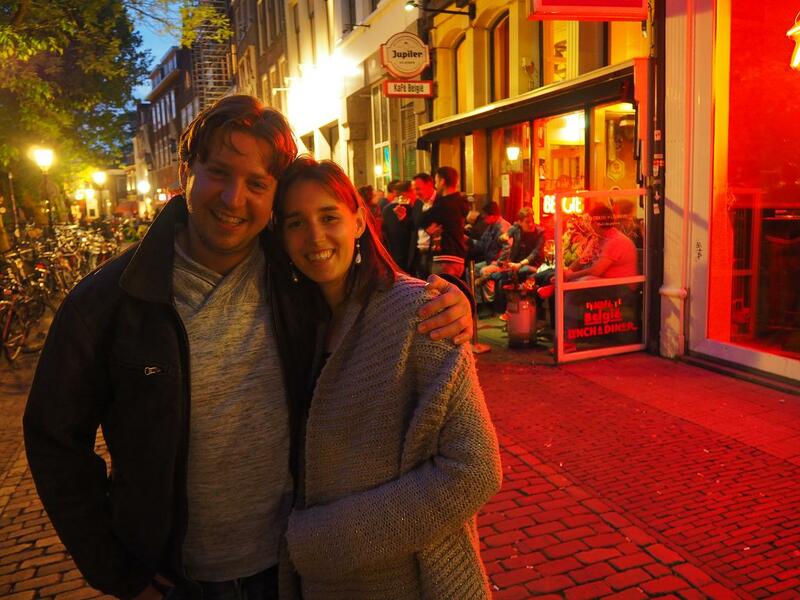 Thanks Sjoerd and Anna for a fun night out! 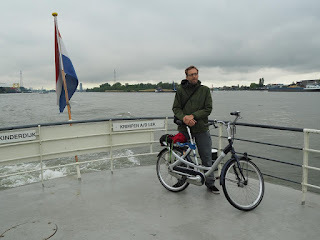 Until now I'd never been to Rotterdam, the less glamorous, grittier and harder working sister of Amsterdam. 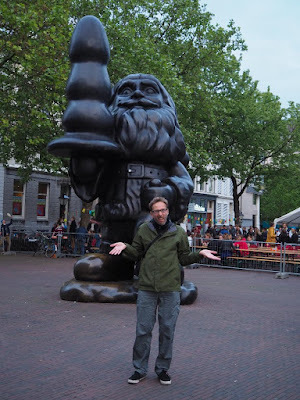 Rotterdam was bombed flat by the Luftwaffe in the opening days of World War II so it doesn't have a historic centre like Amsterdam; what it does have is modern architecture and a burgeoning arts scene with a lot of outdoor sculpture, including this giant bronze gnome. But what the hell is he holding? Its meaning has apparently been the subject of robust debate in the Netherlands; I'll leave it to you to decide. In my search for the quintessential Dutch image, I found this: A working windmill, a dachshund and a windswept cousin named Sanne on a freezing spring day. The three of us were on a walk around the historic fortifications of Gorinchem, the charming riverside town where Sanne lives with her hubbie Erwin and dog Mika. 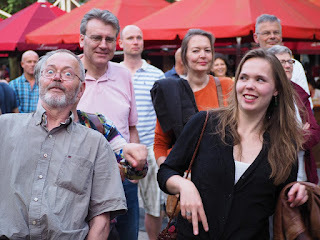 ... and this is Sanne and Erwin, on our way home from a night on the town sampling Dutch delicacies such as bitterballen (crumbed, deep-fried balls containing a mystery meat paste) and white asparagus. Their home is the middle one of the three in the background and overlooks a historic harbour. 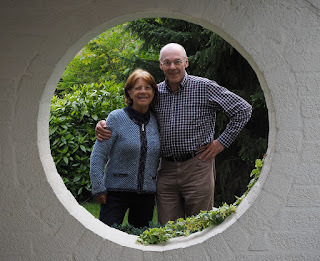 Everyone I've visited has shown me great kindness and hospitality, and Sanne and Erwin were no exception. 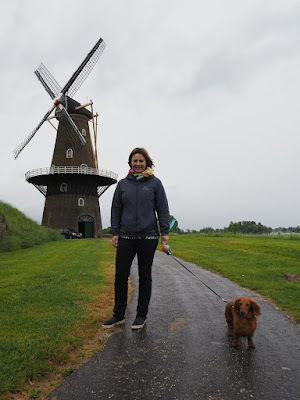 Yesterday I travelled to Cuijk, a small town in the east of the Netherlands, to visit my great aunt Octavie (known to all as Tante Occa). 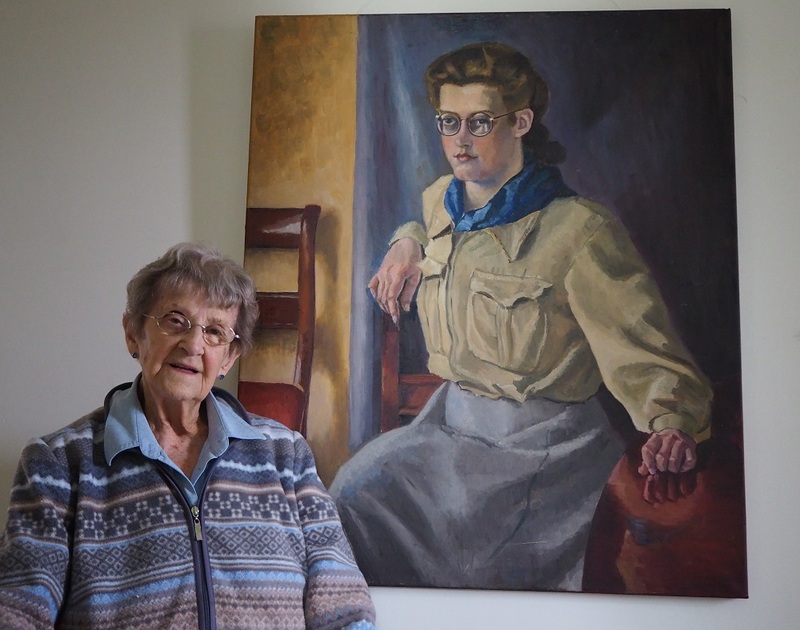 Tante Occa is a legend in mum's family not just for her longevity - she turns 96 later this year - but also for her adventurous life, progressive views and generosity. 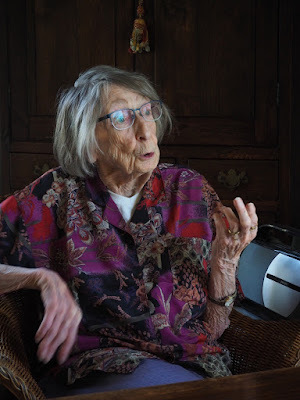 She told me some stories about her years in Tanzania where she was sent as a social worker in the early 1960s to help improve the lot of local women. There she befriended the wife of the country's first president and became a godmother to her daughter, now also a politician in Tanzania. 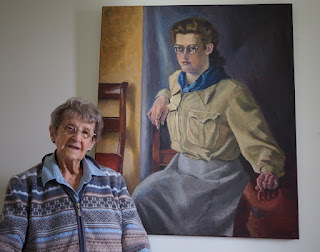 The photo shows Tante Occa with a portrait of her as a young woman, painted by her father (and my great-grandfather) Jan Gall around 1940. When my mum was studying at the Art Academy in Eindhoven many moons ago, her teacher was the Dutch painter Kees Bol. 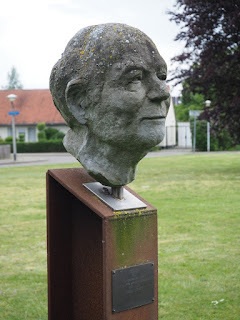 So it was quite a surprise to find a bust of the now well-known artist right outside my cousin Eric's house in Eindhoven. 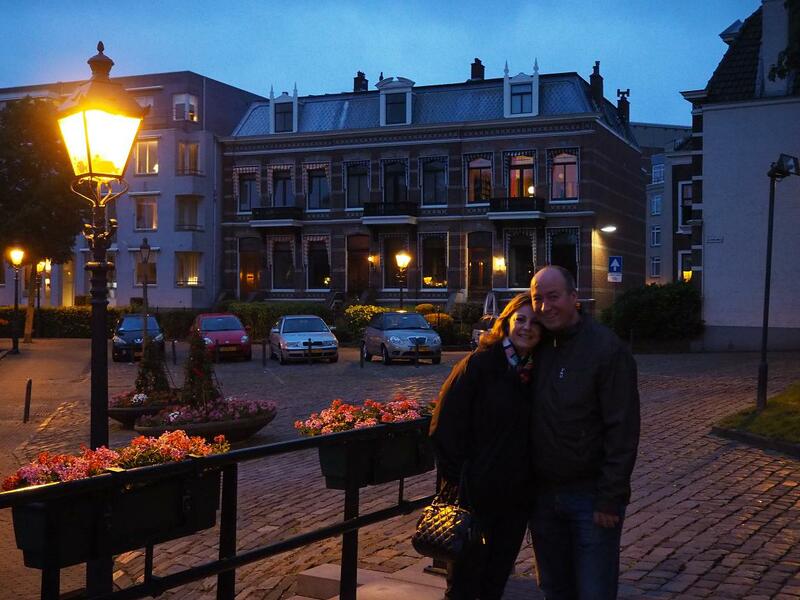 It seems Eric lives just a few houses away from Kees Bol's former home. On a rare sunny day my cousin Eric, who lives in the southern city of Eindhoven, took me on a tour of his favourite pubs. Except this one isn't a pub but a Trappist monastery just across the border in Belgium where the monks pay their keep by brewing some particularly tasty beer and making cheese. This is the kind of monastery I would think about joining. 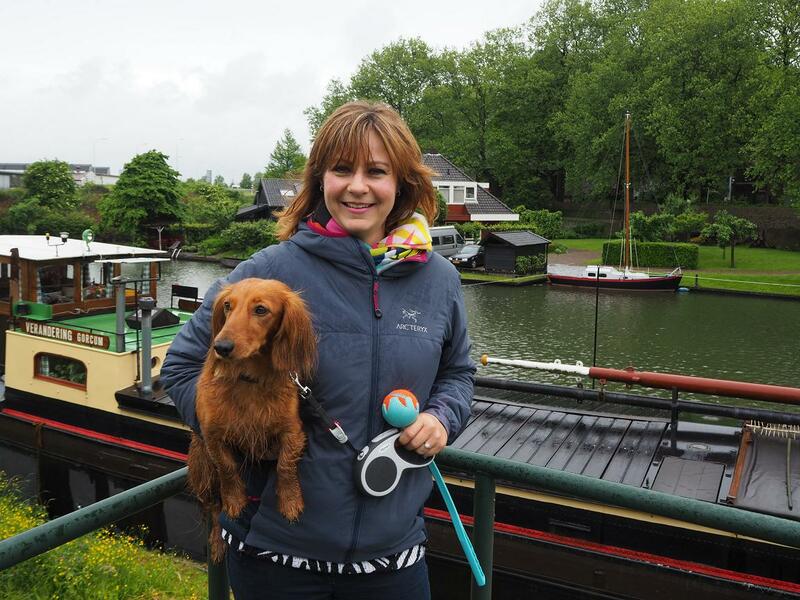 The photo shows us rehydrating after a walk in a Dutch forest and back to Belgium again. speaker of English, Dutch, French, German and Spanish - since he was a boy growing up in France. I also met his lovely partner Mirtha, an Irish citizen who hails from Peru. 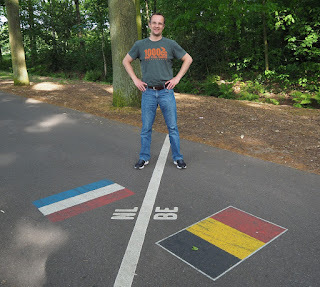 And here's Eric again during our cross-border trek. Thanks for the great stay! Ever since I started coming to the Netherlands I've been visting my uncle Bert, mum's oldest brother, and my aunt Marie-Louise in their home in the village of Son. Photographing them framed in this hole is also a long-standing tradition. This visit was a historic one because while I was in Son their offer on a new house, also in Son but next to the River Dommel where my parents met on a canoe trip many years ago, was accepted. So this is my last photo of Bert and Marie-Louise in the hole. 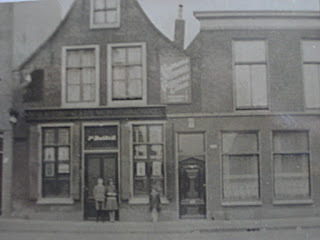 Readers of this blog from the very start may remember that I wanted to find the house in Leiden where my great-uncle had a liquor shop when my father was a boy. 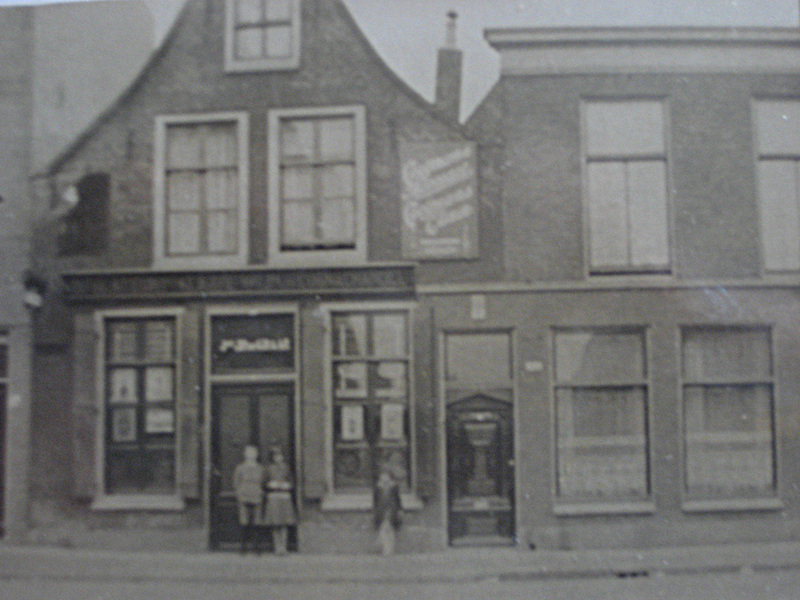 Today, using an old photo, I managed to find it on a street called Lage Rijndijk. Better still, I found an old fellow who bought the building from my great-uncle more than 40 years ago. He gave us a look around in the old liquor storehouse which he'd turned into his home and told us a great many stories. That's him on the right, with my cousin Ted (a just-retired judge) and his son Erik (a soon-to-be business psychologist). ...and this is it today. The shop is long gone but stained glass signs advertising booze and displaying the family name are still there. In the "Hunger Winter" of 1944-45 hundreds of thousands of people in the western Netherlands faced starvation. The little food that remained after five years of war had been seized by the German army. There was, however, still food in the agrarian east of the country. The problem was how to get it - temperatures were well below zero, there was no transport, and civilians were forbidden from passing German checkpoints. On January 10, 1945, my aunt Do (pictured) and her late sister Fien (short for Josephine) set off for the east on borrowed bicycles. They had a forged Red Cross pass (supplied by my late uncle Frans, a member of the Dutch Underground) which they used to get through German checkpoints, in particular at the crucial IJssel Bridge at Arnhem. 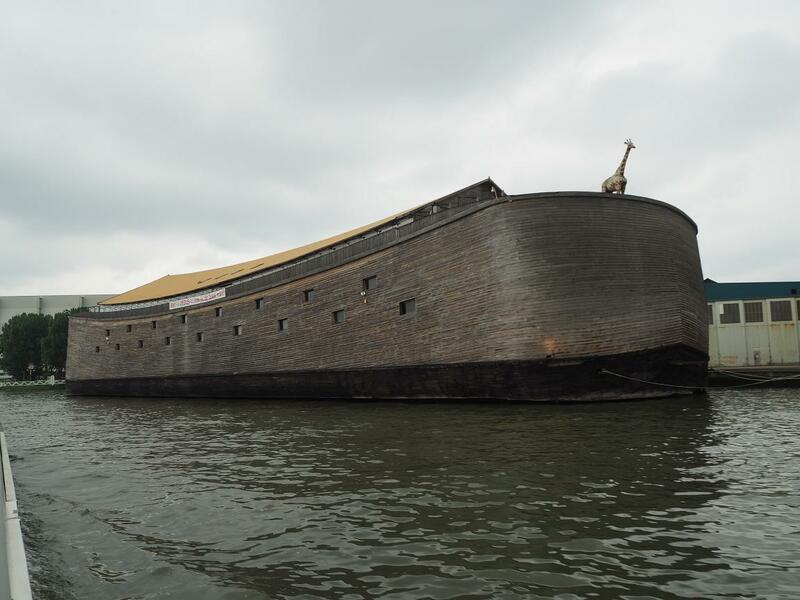 The trip, in subzero temperatures, took three weeks. On the way back their bicycles were so laden with food they had to walk. Somehow they got home with all the food intact; they even cheekily hitched a ride part of the way on a German army truck. 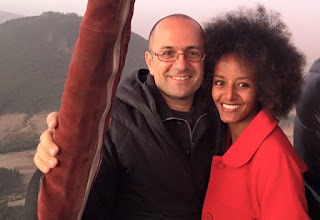 I recorded Do as she told the story of her epic journey to save her family from starvation. She could even remember word-for-word the conversations she and her sister had with the guards at the IJssel Bridge checkpoint. Next month I'm going back for more. Last night I flew a Boeing 737 over Amsterdam, clipping the airport control tower (sorry about that! ), and up the Inn Valley in the Austrian Alps. Here's my co-pilot Peter de Graaf (the other one) after our successful landing in Innsbruck. 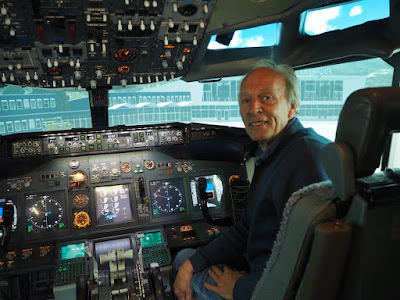 My namesake, who's a town planner by profession, has spent the past few years buying 737 parts online and building a fully functional cockpit and flight simulator. Any parts he couldn't buy he made from scratch; he also did a lot of the programming himself. So now, instead of retiring, he runs a busy flight training business for commercial pilots. There's plenty of demand because he charges a fraction of the big boys at nearby Schipol airport. Peter sacrificed his dinner to take me on a couple of flights, bless him. The man's a genius. Just as I was leaving New Zealand I stuffed an extra jumper in my suitcase. I've been very grateful for that last-minute addition because it's been bitterly cold here - until today. Now it seems spring has sprung. This is the Walburgis Church in Zutphen, in the east of the Netherlands, where I've been visiting my uncle Winfried and auntie Sibbelien. They're rightly proud of their pretty little town and they've been showing me every nook and cranny. 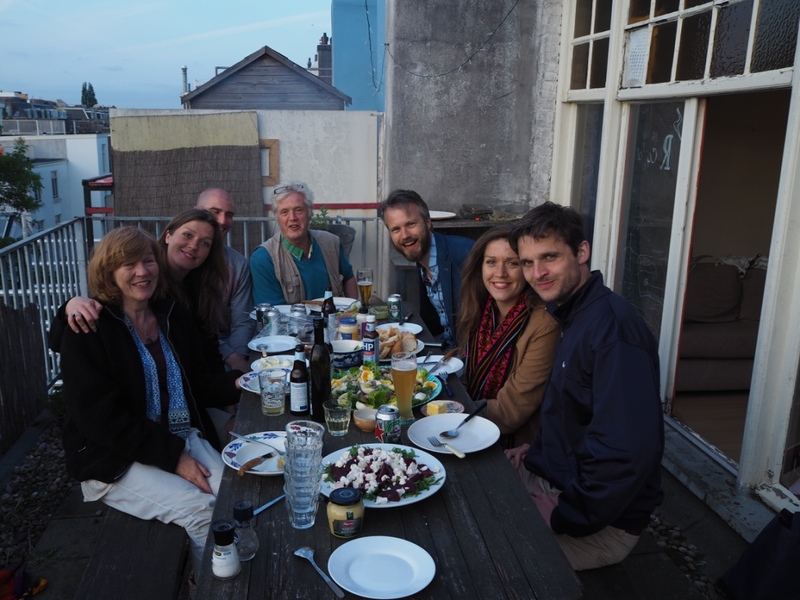 By happy coincidence some of my rellies on mum's side of the family had a get-together on my first full day in the Netherlands, so I got to meet my uncle Winfried, auntie Sibbelien and cousins Matthijs (who usually lives in Sweden), Jolande and Lidwien and their boyfriends. The ocassion was a rooftop barbecue at Jolande's attic flat in an old quarter of Amsterdam. Lively company and a great location. The girls have promised me a tour of their favourite drinking establishments so that's something else to look forward to. 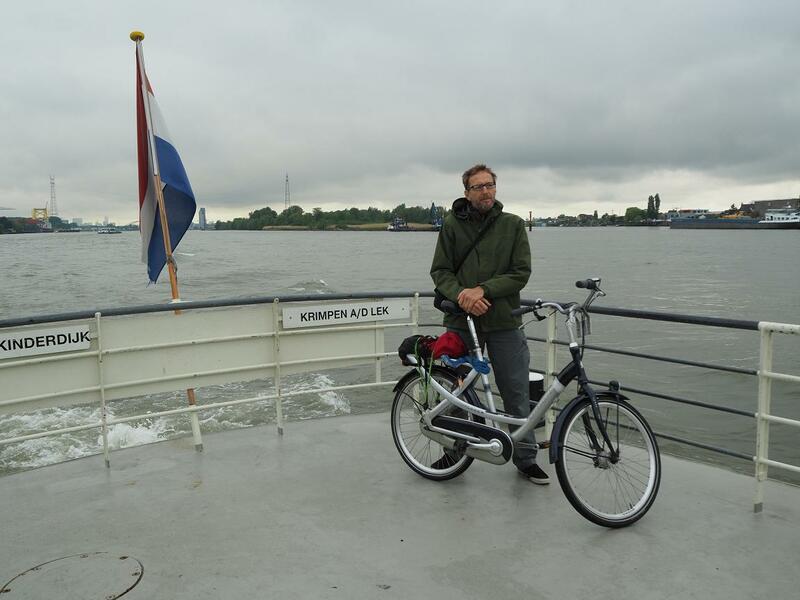 Finally made it to Holland. A bit of a change from the 45 degree heat in Oman but it's great to be here. Staying with cousins Ted and Angela in Uithoorn, just south of Amsterdam; yesterday their delightful daughter Sophie came visiting with her partner Phillip. 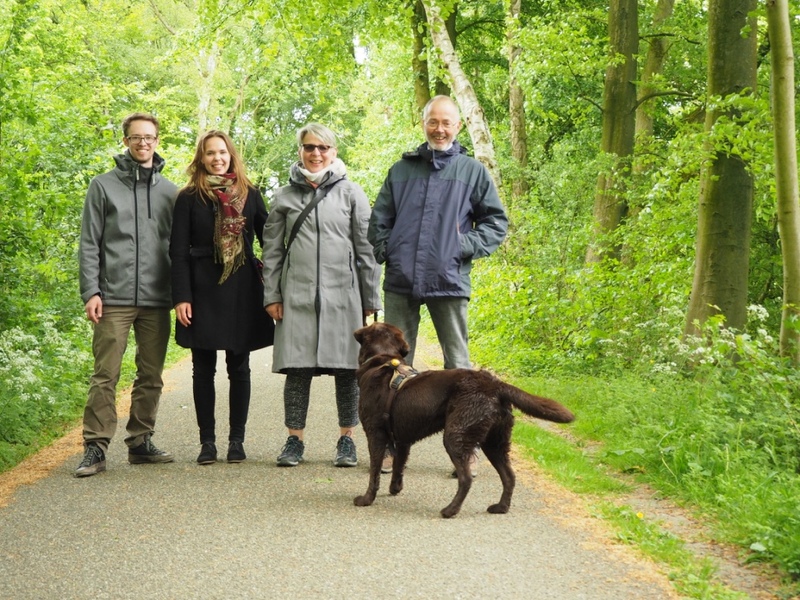 Here we are on a walk in the Amsterdamse Bos (Amsterdam Forest): from left, Phillip, Sophie, Angela and Ted, with Beertje ("Little Bear"). Next month I'm going to Sophie's graduation from the music conservatory in Arnhem. Last night's cultural experience, however, was watching the Eurovision Song Contest on telly. The Dutch entry, Douwe Bob, placed a mere 11th. Oh well. Sunset over Mutrah, Muscat's port district, last night. I'll be sorry to leave when I catch the bus back to Dubai later today. It's been a joy to visit part of Arabia that's held staunchly onto its traditions while also welcoming the outside world. Ma'a salaama. If you're in New Zealand and your money belt suddenly falls apart, almost making you lose your passport (ahem, Kathmandu! ), you go to the shop and buy another. In Oman you walk 20m to the nearest tailor, who studies it carefully and half an hour later has repaired it so perfectly you wonder if it was ever broken at all. The bill: 0.5 rial (about $2). For a wee taste of the rest of the country I took a bus about three hours east to Sur, a centre for fishing and building traditional Arab sailing boats called dhows. They didn't seem to mind me barging into their boatyard and poking around. They just smiled, wished me peace, and got on with their work, using the same techniques (bar a few power tools) they've been using for centuries. The photo shows a nearby fishing village, Ayjah, which is almost ridiculously picturesque with its white-washed houses and fishing boats pulled up along the beach. I have developed two serious addictions while in Oman - to freshly made lime and mint juice, and to the Indian-style tea made with condensed milk and cardamom that Omani men sip from little paper cups at tea stands around the city. However, I also need to eat. Traditional Omani food is surprisingly hard to find; most street food features the universal Arab favourites of shawarma, hummus and flat bread. Accommodation in Oman is expensive but happily food is not. The spread above, including a salad and mango and something juice (other ingredients lots in translation) cost me 1.5 rial, just under $6. Yum. A few kilometres around the coast but a world apart from where I'm staying is the old heart of Muscat. This is where you find the Sultan's palace, the government ministries and an ancient fortress on every corner. The photo shows an Omani couple stopping for a photo in front of the palace. This is the view on the way back down to the coast. That white UFO is a tower in the shape of a giant incense burner, a nod to the frankincense trade that made Oman wealthy many centuries ago. I'd hoped to do a few more hikes - some of Oman's mountain wadis are said to be jaw-droppingly beautiful - but it's just too hot. I'll have to come back in winter. One of the best places to escape the heat in Muscat is the souk, the covered market. It's a maze of wooden-roofed lanes selling everything from tourist tat to frankincense and myrrh. The air is thick with the smells of incense and cardamom. Sometimes you feel like you're in a scene from The 1001 Nights. A six-hour bus ride and one border crossing later I'm in Muscat, the capital of Oman. Oman is everything Dubai isn't - it's low-rise, staunchly traditional and scenically spectacular. It's also welcoming in a low-key kind of way. When I booked the second-cheapest hotel in Muscat I cheekily asked for a room with a view - I didn't think I'd get this. The photo was taken from my window just before sunrise this morning. When it's too hot to go outside I can watch the fishing boats come in, workers fixing the Sultan's superyacht, or Omani men in their flowing white robes and embroidered hats chewing the fat in shady spots along the waterfront. So far the only downside of Oman is the heat. I'd naively hoped it might be cooler than Dubai. I was wrong. The temperature hits 30 C about 8am, yesterday it peaked at 43. I'm sure today's hotter. I'm learning to do what the locals do, which is lie low from 1-4pm each day. After sunset, when the temperature drops back to a refreshing 30 C, the city comes back to life. I can't say I'm a big fan of Dubai. It's touted as a "museum of the future" but if that's the case it's a future of consumerism gone mad. However, you have to take your hat off to what its rulers have created in a bare patch of desert for the day when the oil runs out. Engineering marvels include the Burj Khalifa - the photo is from the 125th floor, as high as they'd me go - which is the world's tallest building at 830 metres, not much short of a kilometre high. With its brash ambition and the dozens of languages spoken by its multi-national staff it felt like a modern-day Tower of Babel. Departure is 6pm NZ time on May 5. This will be the last blog post you see from me for a while, at least until I find myself near a computer again. 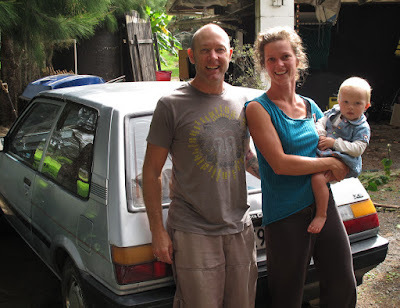 There are so many things to organise before a big trip, but one of the most pressing problems was finding a suitable foster family for my trusty 1987 Toyota (official name: Silver Lightning). Today, at the last possible moment, it all came together. So, first it's going to the fabulous Nick and Eva (pictured here with their youngest, Francesca), who will use it to run around town until they too go on holiday; then it will go to ferry driver extraordinaire Nadia, who will it keep dry and loved in a car port in Opua. 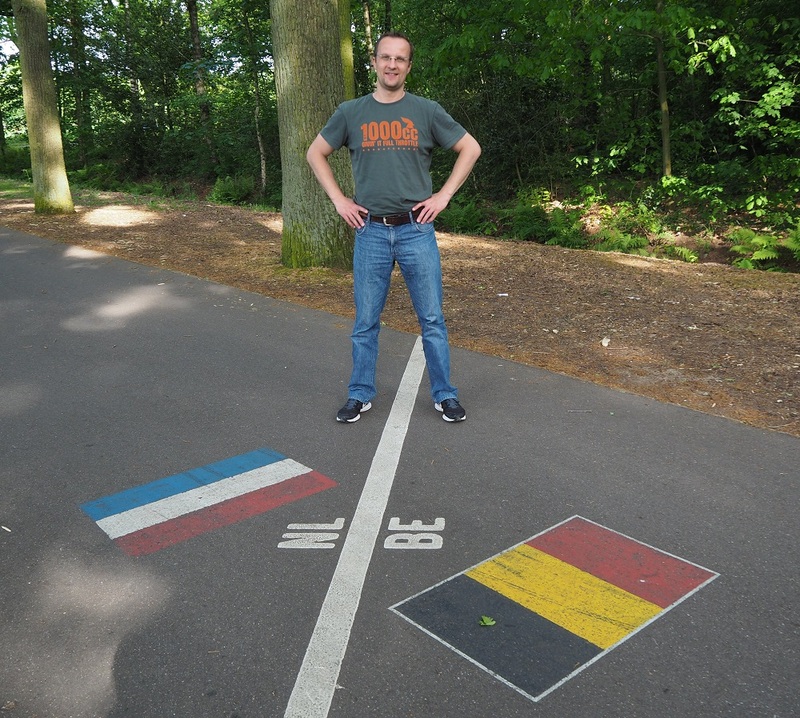 Thanks to you all, and everyone else who has helped make this trip a reality - the de Graaf and Gall families (Tante Do in particular); my boss, for accidentally giving me as much unpaid lave as I wanted; my colleagues who will make sure the news from the Mid North keeps being told; and my landlords Mick and Annemiek for being so accommodating, finding a tenant while I'm away, and being prepared to have me back in October.